There are two notions that to me seem have been injected out of the blue into the mainstream. This came for me out of nowhere. The first Wikipedia articles are from 2004 (and late 2003) but I've never heard it until Google Go was described as something good for systems programming. So basically all variations start showing up the same time as Google Go is introduced and even those that show up are basically job adds that just happen to have 'systems' and 'programmer' in them. It's safe to say that Google Go brought the word systems programming into the mainstream. 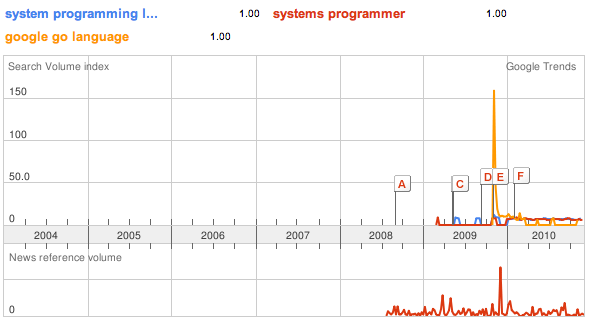 If you are looking at Wikipedia, even the description of the C programming language is filled now with "system software" and "system programming" but go as far as the 2004 version and "system programming" is gone. In the late 2002 Wikipedia version it doesn't even mention 'system software'. I think Apple thought long on hard about how to put a positive spin on the whole closed ecosystem they are selling with iPhone and AppStore and figured out the curated word. It's actually quite brilliant -- the experience is locked down, but it's curated, so we have someone there (the curator) that cares deeply about your experience. Enough with my linguistics musing for tonight. Let me know about other words and phrases I might have missed!